EZE-Fold Fine Diamond Sharpener.4" x 3/4" sharpening stone. 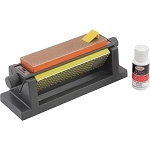 Flip stone out for sharpening,fold back for storage.EZL-501 Fine grit. Red plastic handles.